For those needing portability, Rad Pro for Desktop works with Windows 8.1/10 tablets. Will not work with Surface tablets running Windows RT. 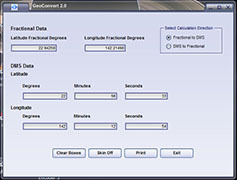 This software was developed because from time to time, we found it necessary to convert GPS meter readings from fractional latitude and longitude to degrees, minutes and seconds (DMS). It only does this one thing but it does it very well. Version 2.0, just released 5/23/2007, now converts both directions (DMS to fractional and fractional to DMS). It also has a new, modern look. A new Vista friendly installer was added 8/24/2007. The download includes the required .NET 2.0 Framework so it is 34 Megabytes in size. Current users: Please uninstall version 1.0 before installing version 2.0.